Now here's something you don't see everyday, an analyst firm predicting that Microsoft's mobile operating system will trump Apple iOS and Research in Motion's BlackBerry. Don't believe it. I surely don't, and with good reasons. The skinny: Today IDC predicted that by 2015, Windows Phone 7 and Mobile would reach 20.9 percent global market share, as measured by shipments, on smartphones -- up from 5.5 percent this year. By comparison, iOS share is predicted to be nearly flat over four years, with smartphone OS share of 15.3 percent in 2015. IDC predicts Android will grow to 45.4 percent from 39.5 percent. "Up until the launch of Windows Phone 7 last year, Microsoft has steadily lost market share while other operating systems have brought forth new and appealing experiences," Ramon Llamas, IDC senior research analyst, said in a statement. "The new alliance brings together Nokia's hardware capabilities and Windows Phone's differentiated platform. We expect the first devices to launch in 2012. By 2015, IDC expects Windows Phone to be number 2 operating system worldwide behind Android." What is Llamas smoking? IDC is giving a whole lot of weight to Nokia's Windows Phone distribution agreement with Microsoft. It's a deal that won't bring new phones to market until 2012 and faces huge logistical hurdles. The change in primary mobile operating systems will disrupt Nokia's relationships with carriers, customers, developers and distribution partners. Apparently, IDC has bought into Microsoft's reasoning it can buy market share not easily generated organically. 1. It's simply too early to rightly predict 2015. The market is too volatile and fast-changing. IDC's 2014 smartphone OS forecast, released little more than six months ago, is evidence enough. Then the analyst firm predicted that iOS share would fall to 10.9 percent by 2014, for a 25.8 percent decline. Since, iPhone 4 proved to be hugely successful and Verizon started distributing the smartphone. IDC also hugely underestimated Android growth (again), predicting 24.6 percent market share by 2014. But Android already exceeded the projection in 2010 -- just months after IDC's forecast. Assuming there is approval, AT&T will acquire T-Mobile by early 2012, which could greatly diminish the number of Android phones available through US carriers, while making iPhone easily available to as many as 30 million new subscribers. That's all without looking at the iPhone sales that iPad may generate -- from the so-called "halo" effect (see #3). 2. IDC presumes Windows Mobile will gobble up most of Symbian's market share. IDC has Symbian going from 20.9 percent smartphone OS share in 2011 to .02 percent in four years. Perhaps not coincidentally, 20.9 percent is the forecast share for Windows Phone/Mobile. Microsoft's operating system would grow by 67.1 percent compound annual growth rate (CAGR), with Nokia's OS falling nearly equally -- 65 percent. But given the aforementioned market volatility and already changed forecasts, there is nothing certain about a clean swap between Symbian and Windows Phone. Consider also that IDC is already forecasting a more rapid decline in Symbian share today than it did in September -- and the 2010 numbers were wrong. 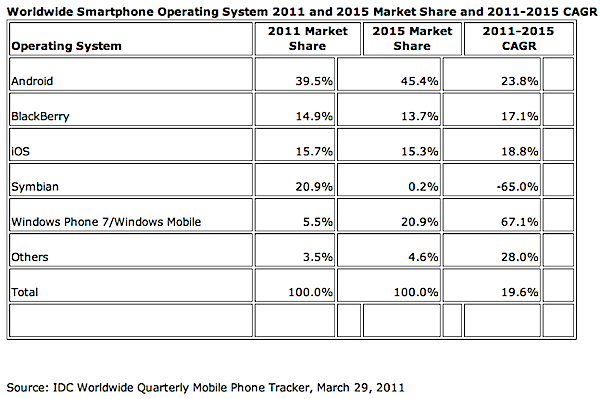 Just three months before year's end, IDC predicted Symbian would have 40.1 percent smartphone OS market share in 2010. Actual share was 33.1 percent, according to IDC. 3. The forecast doesn't account for other handset categories or percentage of smartphones shipped. Nokia sells three dumphones or feature handsets for every smartphone, particularly in core countries like India, where market share approaches 70 percent. Smartphones are too costly in many emerging markets, where 3G often isn't yet available. Nokia faces a tough transition to smartphones that is sure to cost it market share and even local distribution -- particularly as more regionally produced brand and white box Android phones are sold. Hell, some white box manufacturers might sell Symbian phones to Nokia customers not wanting to switch operating systems! From the broadest perspective, Windows Phone OS market share could eventually be greater than IDC states, assuming Nokia puts the software on dumb phones and feature phones. Meanwhile, Android is moving to these same device classes, which will likely affect smartphone OS market share up or down. But that's all conjecture about a changing market. I can't say with any degree of certainty, and neither can IDC. Nothing is certain, or even predictable. Then there is the Apple factor. In September 2009, I asserted that "Apple cannot win the smartphone wars," something Gartner and IDC actual shipment data bears out. However, in August 2010, I observed that "Apple can still win the platform wars, but it won't be easy." Apple's mobile operating system isn't just about smartphones, there are tablets, too -- and iPad 2 is hot selling. There is no way IDC, which can't even get numbers right for three months let alone four years, can anticipate how the broader iOS platform will expand because of iPad. If Apple wins that platform war -- and as I explained yesterday it just might -- smartphone OS market share won't mean much in four years. Where developers can make the most money, they will go. Where developers go, the market will follow. That's without factoring the broader ecosystem of peripherals, cases and other iPad and iPhone add-ons. In September 2010, I asked "Are IDC and Gartner mobile OS forecasts trustworthy?" The answer is an emphatic "No!" Another proofpoint: In September, IDC forecast global smartphone shipments would be 269.6 million. Actual number released today: 303.4 million. As data errors go, that's pretty big. However, should IDC's prediction prove to be right, I'll make atonement. If Windows Phone is No. 2 smartphone OS by 2015, I'll kiss Microsoft CEO Steve Ballmer's feet. He can take off his socks and shoes, too.